Recover your lost SimplySync Backup license. To easily recover your license, please Log in, or Create an account, if you don't have one yet. If you prefer, you can fill out the form below, in which case you will need to fill out both fields. Please enter your hardware ID: Where do I get this? 1. 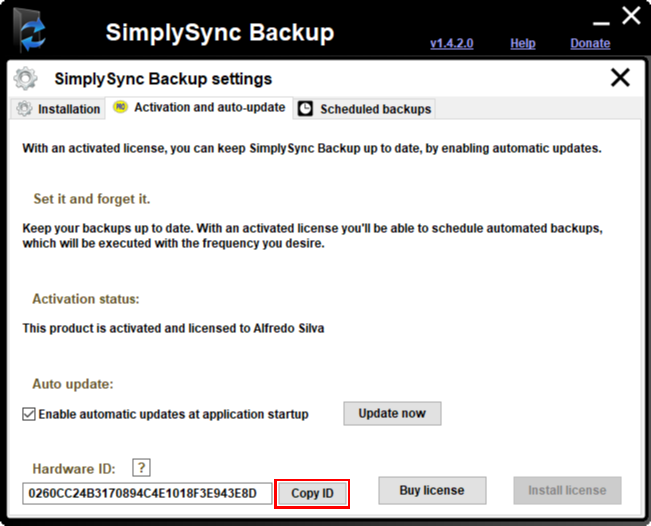 Launch SimplySync Backup, press the Settings button, and then select the Activation and auto-update tab. 2. Press the Copy ID button at the bottom of the dialog box, to copy the hardware fingerprint text to the clipboard. 3. Paste the copied text in the Hardware ID field above. If you're purchasing from a different device, you can manually enter the hardware fingerprint into the corresponding field.